You'll get unimaginable Comfort of silky soft water, that won't turn eyes red, dry out skin or bleach clothing and toys. It's more natural approach to chlorination also eliminates the harsh chlorine odor associated with factory-produced chlorine. Convenience means no more mixing, measuring, dispensing and lugging heavy buckets and jugs of harsh Chlorine. With Salt Chlorination, sanitizing pools happens automatically by converting ordinary salt into Chlorine. Automatically - now that's Convenient. 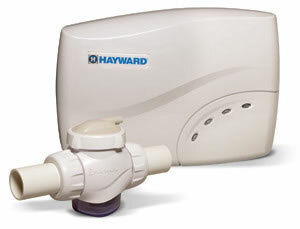 What if you could get the Comfort and Convenience you desire, but at a savings on chlorination Costs of more than 50%? You can, with Salt & Swim 3C. Salt & Swim 3C's salt cell produces a ton of chlorine - literally but at more than half the cost of other forms of Chlorine. This SAS-PRO model is designed for use with 2" pool plumbing and must be installed by a qualified installer. The Cell Vessel must be glued in the pool's plumbing system. Use the SAS model (non-glued unions) if you intend to install the unit yourself in 1½" or 2" plumbing.